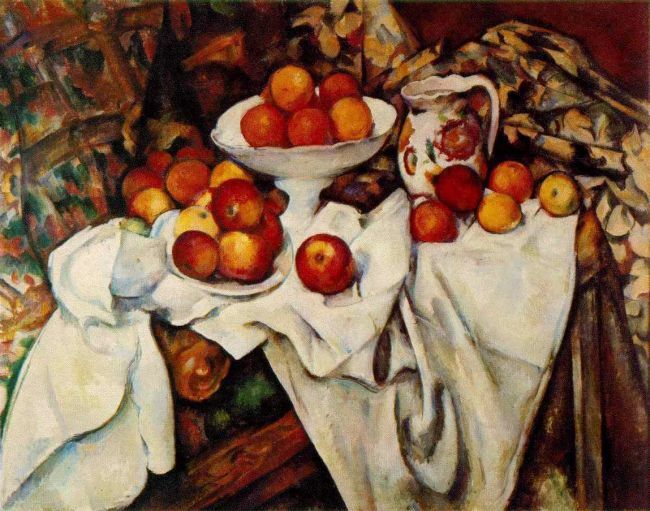 Lively and colorful still life painting by Paul Cezanne (1839-1906) of a table full of apples and oranges. One of six in a series, some consider this painting one of the best still lifes painted by the artist near the end of his life. Painted around 1899 in oil on canvas, we see a table with a white cloth, earthenware dishes and a floral water jug. Two different and brightly colored fabrics might be from furniture, drapes or some other unknown object but they provide even more bold splashes of color.